Do you consider yourself creative? Do you find pleasure in making things? Maybe you spend free hours practicing a certain craft. Perhaps you paint, or draw, or design things. Or maybe you’re someone who says, “I’m not very creative,” because you don’t do any of those things. British artist John Constable (1776 – 1837) is among my favorite painters. Through his paintings, he elevated the mundane to prominence, a place of admiration and praise. The Hay Wain (1821), probably Constable’s most famous painting, is based on the landscape in Suffolk, near Flatford on the River Stour. A hay wain, which is a type of horse-drawn cart, is pictured in the water in the painting’s foreground. A simpler, more ordinary scene would be hard to find. Yet by rendering it with his oils and brushes, Constable causes us to contemplate it nearly 200 years later. The Hay Wain is part of the artist’s early series of six-foot-wide Stour River paintings. John Constable’s Wivenhoe Park, Essex (1816) oil on canvas. According to commentary from the National Gallery of Art, “Constable believed the Stour valley had set him on the path to his life’s work, and he chose it as his primary subject for much of his career. The area became so associated with his painting that even during his lifetime it was called “Constable Country.” That’s the power of creativity. An entire region of Great Britain elevated in the consciousness of the world because Constable turned the ordinary into the extraordinary through his creative touch. Acknowledged or not, people everywhere share one thing in common: we are all creations of an awesomely creative God. In turn, each of us is creative in unique ways. Some, like Constable, express that through visual arts. Others through music, or writing. One may arrange flowers, while another shares notes of encouragement. Still others leverage the creative power of mathematics and engineering to solve problems on earth and transport us to the stars. Each is a creative act at its core. We can’t help but be creative because we are made in the image of the ultimate creative being, originally fashioned from ordinary dirt. The extraordinary from the ordinary. Like a potter forming a clay vessel, God designed us and formed us into existence. The Scriptures show us His magnificent, limitless acts of creation — from His speaking the universe into existence in Genesis to glimpses of His heavenly realm in Revelation. But I’ve realized that God is not only the Creator. He is the Re-creator. The Reclaimer. As we approach Easter, or Resurrection Sunday, allow the Passion week to focus your thoughts on the great sacrifice Jesus Christ made to take our sins — and the righteous wrath of The Father — upon Himself. Consider how much it cost God to be able to judge our sin but also to show us mercy and offer us forgiveness. And this year, I’ve been reflecting on how amazingly creative God is in all of this. Not only was God creative in bringing us into existence, He was just as creative in reclaiming us from the power of sin. Consider just a few highlights from the account of the Passion week and see for yourself how God re-creates and transforms the ordinary into the extraordinary. Like the painterly touch of Constable draws us to contemplate a cow pasture or a hay wagon 200 years on, God’s loving, creative power draws us to meditate on a simple garden. Why? Because He transformed it into a reminder of the decision each of us faces about whether to obediently follow God. How will we respond to the call to faithfulness? Read more in Matthew 26:30-75. A meager meal of bread and juice, touched by The Lord, becomes a lasting reminder of our Savior’s deep love and sacrifice. Read more in Matthew 26:17-30. 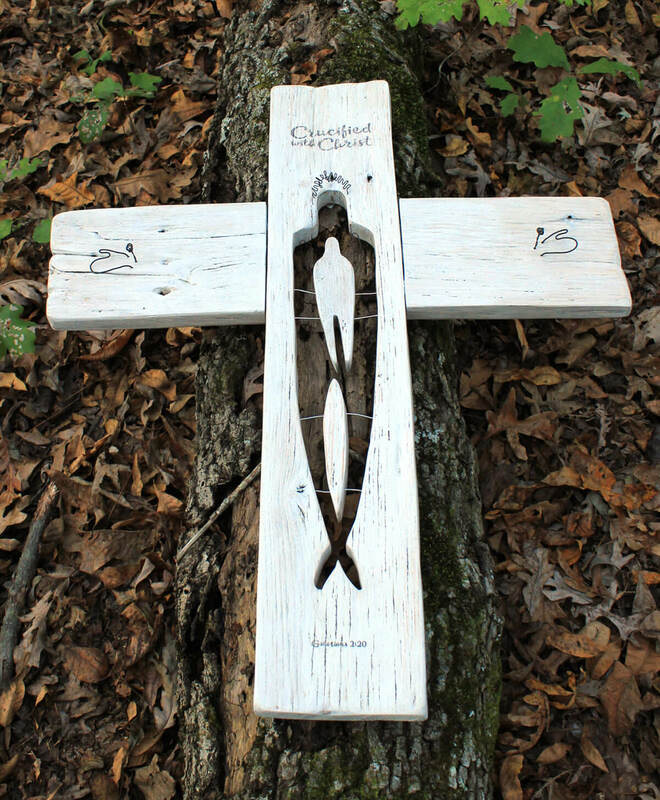 His loving, creative power even 2,000 years on, focuses our vision on a simple wooden Cross — a thing of agony and humiliation — transformed into a symbol of sacrifice, mercy, and unimaginable forgiveness. Read more in Matthew 27:32-61. The designer of the human body, that Good Friday, reclaimed corpses from their graves, transforming them into living testimonies of the power of God. Read more in Matthew 27:50-53. And He turned a simple newly cut grave, really just a hole in a rocky hill, into an eternal symbol of His power and absolute victory over death. Read more in Matthew 28. Creativity. Creation. Re-creation. Reclaimed from destruction. That’s the story of this season.